Once Vol. 2 begins, it grabs you immediately. Set just a few months after the near-perfect (in my mind) first film, Guardians of the Galaxy Vol. 2 starts with a flashback like its predecessor, then segues into a massive action scene during the opening credits with four of the five Guardians fighting a mythic beast. The fifth, Baby Groot, just dances along to the music as his friends get the crap beat out of them and the credits roll. The scene is a delight. It’s perfect. It’s everything you expect from a Guardians of the Galaxy movie written and directed by James Gunn. It’s filled with humor, action, beautiful visuals, audacious choices, and killer music. Instantly, you’re as connected to these misfit heroes just as you were in the first movie, just as they are to each other. 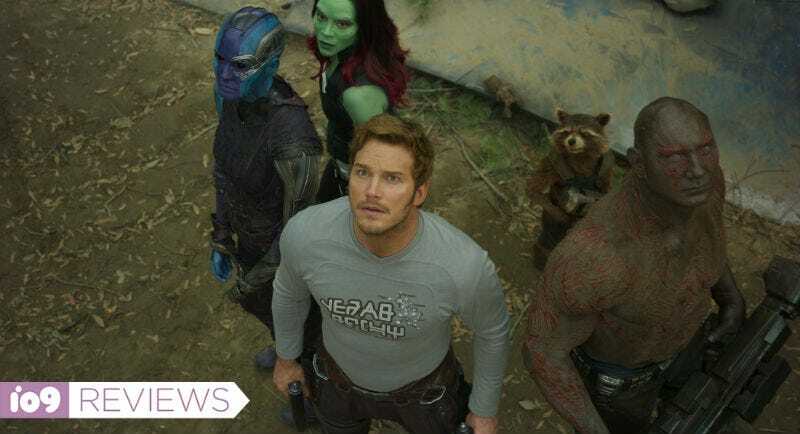 The Guardians’ world—er, galaxy—is familiar yet feels ripe with potential wonder and weirdness. Seeing the team back together is awesome, and you can’t wait to see their new adventure. This is where Vol. 2 zigs instead of zags, because instead of keeping the Guardians together, everyone is given an individual story path that they will take through the bulk of the film, and only a few of these paths cross. As a result, the film always has several intriguing storylines going on at once, but it’s also lacking that strong cohesion that helped made the first movie so beloved. Chris Pratt and Kurt Russell are father and son in Guardians of the Galaxy Vol. 2. Here’s how it breaks down: The Guardians are being hunted by an alien race known as the Sovereign after Rocket steals from them. Right after that Kurt Russell shows up as Ego, Star-Lord’s mysterious, absentee father referenced in the first movie. Once that happens, Star-Lord (Chris Pratt), Gamora (Zoe Saldana), and Drax (Dave Bautista) go off with Ego to find out more about his past, while Rocket and Groot get captured by the Ravagers, hired by the Sovereign to kill the Guardians. On Ego’s planet, we meet Mantis, a mysterious new character played by Pom Klementieff. With the Ravagers, several new characters come to the forefront, including Taserface played by Chris Sullivan and Kraglin played by Sean Gunn. And pretty much that’s it. For the rest of the movie, the characters are more or less restricted by their storylines. To compensate, the film really takes its time exploring each of them. It slows down the pace quite a bit, but it also allows for a lot more intimacy—we really get into the psyche of Peter’s struggles of finally meeting his dad, of Gamora and her step-sister Nebula’s contentious relationship, and of how Rocket feels about the team. That goes for some of the new or expanded characters, too. Michael Rooker’s Yondu has a larger, much more significant role here. Ego has a huge backstory—as befits a Living Planet—and purpose in the movie. Gunn’s story, simple as it may seem on the surface, is actually incredibly layered because of the amount of time we spend each character in a single situation. Even if none of the stories happening feel like the central focus of the film, having so much happening at once gives the film an unexpected and powerful emotional core. Moreso than almost any other Marvel movie, the tearjerking potential in Guardians of the Galaxy Vol. 2 is through the roof. And yet, with the movie so focused on character and relationships, it can occasionally feel flighty. We latch onto the Peter/Ego story, then have to cut to Yondu and Rocket. Then it’s Gamora and Nebula, followed by the Sovereign. Individually, the scenes are excellent, and there’s always a lot going on, but without a clear goal or main villain, the film seems to be missing a sense of purpose. Everything in the center of the movie feels like its meandering, like they’re all waiting for something to bring them all back together. And then something does. I won’t spoil it, but there’s a huge twist, the team reunites, and then the original Guardians of the Galaxy magic is back for the better part of its last act. Add to that five different Marvel end credit scenes(!) and you’re almost certainly going to walk out of the theater with a smile on your face. This is the triumph and the tragedy of Guardians of the Galaxy Vol. 2. Oh, there’s nothing I specifically dislike about it, and I legitimately love a lot of it. But the shadow of that first movie just looms so largely. You can tell Gunn wanted to do something different with the sequel, defy some expectations. He succeeded—Guardians of the Galaxy Vol. 2 is a deeper, more surprising, emotional and layered movie than Vol. 1. But then there are those times it so perfectly captures the energy and excitement of the first movie, so whenever the film isn’t basically mirroring its predecessor, you can’t help but want more of what made you fall in love with the Guardians in the first place. It’s as if you’re—dare I say it—hooked on a feeling? Mantis and Drax share a special bond. Vol. 2 is not exactly the Guardians of the Galaxy movie you are expecting, which can sometimes feel a little like a letdown. It explores some new directions, but also isn’t afraid to bring back classic hits from the first movie, too. After an awesome start that’s sure to appeal to fans of the original, the tape’s—er, the movie’s middle section slows things down, which ends up varying wildly and can make it feel like it’s dragging things down. But then it brings back the full band for a killer final performance. And by the end, even wth its differences, Vol. 2 is just as awesome as its predecessor. It’s just a different mix of awesomeness. That’s all.